Industrial Suppression Systems help prevent damage to large, high value assetsBusinesses install industrial suppression systems to protect their facilities and products from the damaging effects of smoke and fire. These systems help prevent the loss of equipment and data as well as minimize interruption for their business operations. There are a variety of applications for such systems including: data processing and communications to aviation and semiconductor processing plants, and more! For these large applications, you need experts with the knowledge and skill to assist you in all phases of system design and implementation. 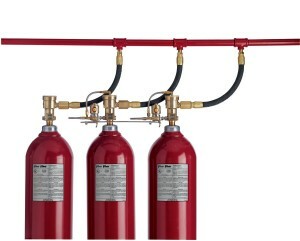 Reliable Fire & Security is experienced in the installation and servicing of industrial suppression systems. We offer innovative solutions for complex industrial suppression needs. Our experienced project management team will assist you from design through installation and service. To determine the type of detection and suppression system your facility will need, our NICET licensed and certified experts will perform an analysis which includes an evaluation of all sources of fuel, ignition, heat and oxygen necessary for combustion to take place. They will also be able to determine if any environmental or physical conditions are present near the hazard that will have an impact on the fire. We work with your team to determine an optimal, cost-effective solution.